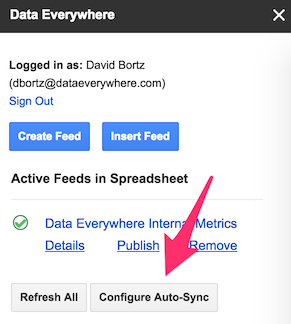 This article will help you set up automatic refresh of data from Data Everywhere to a Google Sheet. The automatic refresh will overwrite all data on the tab where the feed exists, including the old revision of the feed and any changes made to the data. The refreshes run hourly, due to restrictions from Google. The automatic refreshes are all run from Google's servers, so there is no need to have the spreadsheet open, or even be logged in to Google or have your computer turned on for them to work. This is a great way to edit data in Excel while sharing it via Google Sheets! Close the pop-up. Your feeds will start automatically refreshing within the next hour!